Not to long ago I shared with you, how I organized my spices. Do you want to know what I did with all of those empty spice containers? Most of them got sent to the garage where I plan on one day using them to organize all of our nails, screws, and other small items. 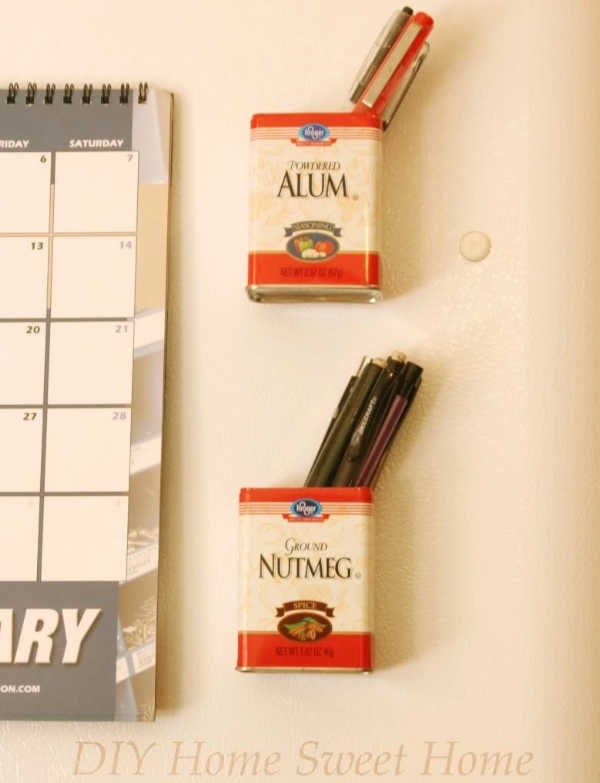 However, the nutmeg and alum tins were just too cute to hide away in the garage. Instead, they found a new home on our fridge. They are perfect for holding pens and pencils. These were so easy to make. I just popped the lid off, stuck a couple heavy duty magnets to the fridge, then stuck the tins to the magnets. No gluing required. Would love to know your thoughts on them? Leave your opinion in the comments below. Thanks, I've always loved these spice containers. Okay, I really like that idea! Thanks for sharing! Your welcome. Hope I inspired you! Cute idea. Thought about doing this with soup cans too. My husband is afraid te tin would eventually scratch the fridge though. What do you think? The magnets I used are very rough and would definitely scratch the fridge. I ended up tearing off a small piece of a paper towel and placing it between the fridge and magnet. You can't see the paper towel at all and there are no scratched on the fridge. They look so cute!I do this too:) I've got a mounted box holding pen and paper - for writing the grocery list! I used to have a box too!! However, it was destroyed during our last move. I need to find some tine to do this. Hmmm. Doing a charity shop trawl for something else today, maybe I'll spot a tin or two as well. I love your idea! I use these spice tins and hate putting them in the recycle bin. This is a great way to recycle them and also have an interesting conversation starter on the fridge. Thanks for sharing! I never would have thought of this. So clever and so appropriate for a kitchen. Such an easy idea and perfect for those pens that always get misplaced! so simple yet so effective, what a great idea! I use the 3M sticky tabs for those little hooks. You know, the ones that when you pull on them, they release and are good for hanging small pictures and such. 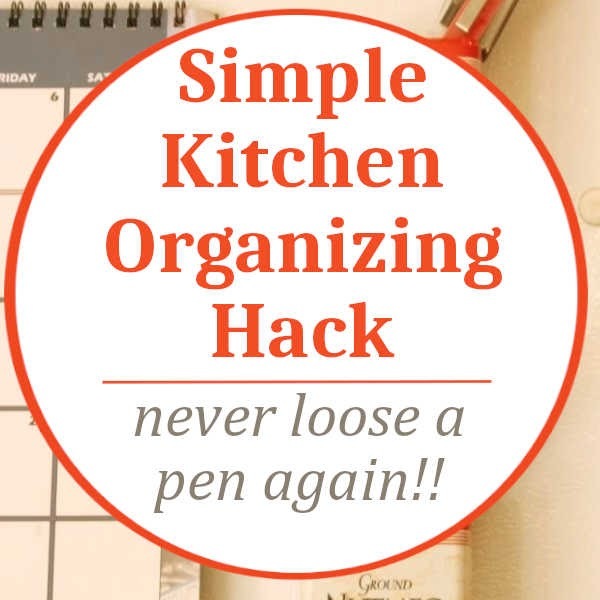 I put the hooks inside my cupboard and hang spoons, little organizing containers and most helpful of all, I space a couple hooks and use three ring binder sheet protectors to hang my phone list above the phone and my most frequently used recipes, like pancakes in another cupboard. My kids can always find the Chocolate chip cookie recipe.